The subject of this week's Concept Art Writing Prompt has a rather unusual body type: skeletal. Is she the result of a medical experiment gone awry? Some sort of ghostly creature? An especially dedicated cosplayer? Write your own story about this strange lady. 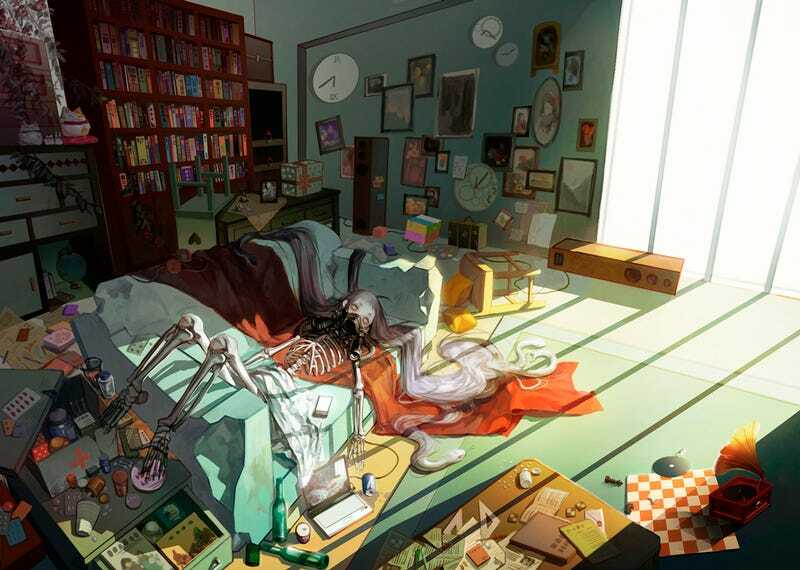 This week's image comes from Pixiv user Bsanshuiji via The Art of Animation. (Click on the image to see the whole thing.) As always, we invite you to come up with your own story based on this image and post it in the comments. Dr. Rice says that it's all in my head, and then kind of laughs in a way I don't like. I ask him what could be wrong with me and he tells me that I'm in miraculously good condition, all things considered. He hands me my tea and runs his fingers through my hair. His hands feel like snakes slithering across my scalp. The tea helps me forget that my body is held up by something other than muscles, helps me shut out the not-quite-inaudible hum of the nanites spread across my naked skeleton. Now I spend just the first few minutes of my day in total horror, until the tea kicks in and I can stop strumming my bony fingers across my rib cage. It makes awful music. I used to scour the science sites, hunting for news on the progress of regeneration, looking for signs that flesh will someday bloom over my bones again. Dr. Rice tells me that the real advances don't make the news, but I don't know whether to believe him. I'm his trophy, after all, a living head atop bone, but if I die, won't his celebrity fade? Sometimes I consider diving out the window just to spite him. "I need fresh air," I tell Dr. Rice. "I want to sit in a cafe and sip coffee and watch the world go by." He sweeps the back of his hand across my ulna. I think I'd shiver if I still had the nerves. "We don't know how the nanites will hold up outside. I'll get you coffee. Anything you want. Croissants? Macarons?" I give him my order, for the farthest cafe I can think of, and as soon as he leaves, I pull out the bins of gauze I've been stealing from the nurse's station. I hurriedly wrap my fingers and feet before slipping on socks, shoes, gloves, and my coat. I once stopped looking for regenerations advances online, I'd started looking for instructions on how to make a bed sheet escape out the window. I dash across the hospital lawn, not out of fear, but exhilaration. Maybe the nanites will wear down. Maybe Dr. Rice was telling the truth and regeneration was well on its way. But body or no body, if I was going to die, at least I was going to live first.